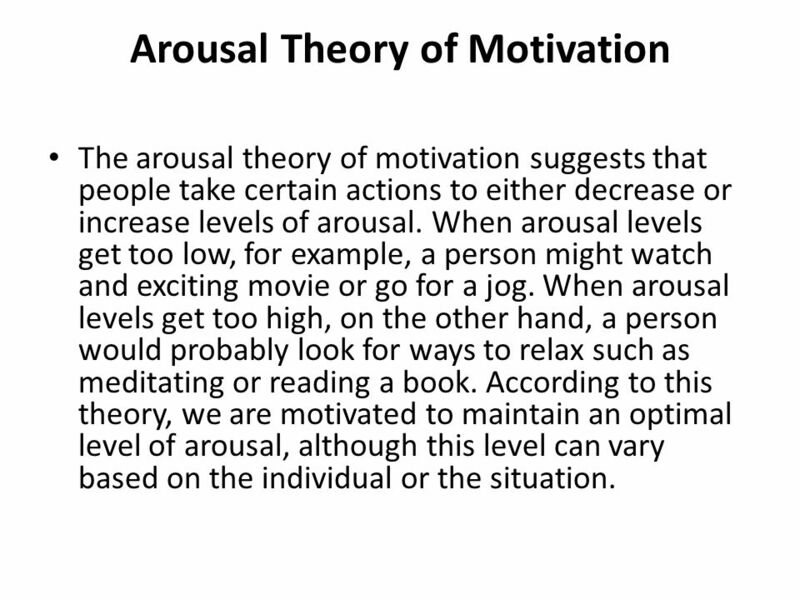 The arousal theory of motivation suggests that people take certain actions to either decrease or increase levels of arousal. When arousal levels get too low, for example, a person might watch and exciting movie or go for a jog. When arousal levels get too high, on the other hand, a person would probably look for ways to relax such as meditating or reading a book. According to this theory, we are motivated to maintain an optimal level of arousal, although this level can vary based on the individual or the situation. 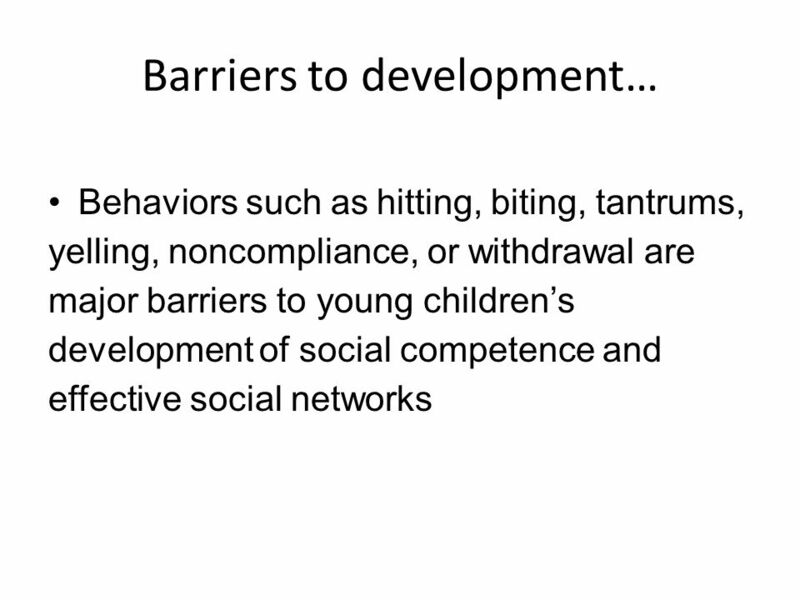 8 The norm… The percentage of young children who continue to exhibit challenging behaviors into their preschool years is estimated at approximately 10%. 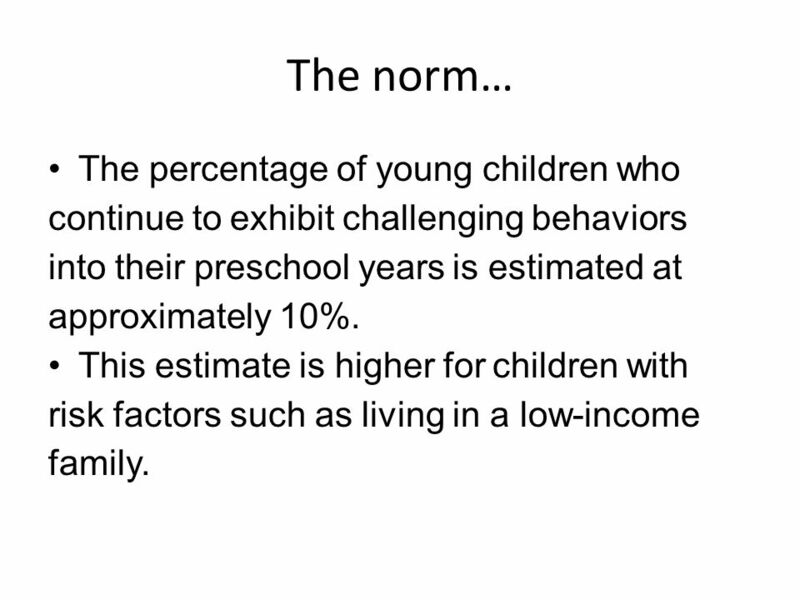 This estimate is higher for children with risk factors such as living in a low-income family. 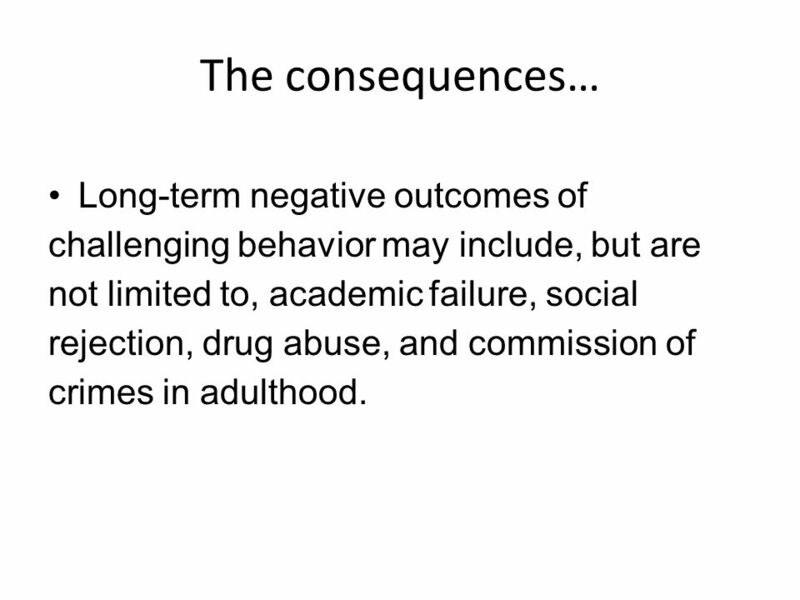 9 The consequences… Long-term negative outcomes of challenging behavior may include, but are not limited to, academic failure, social rejection, drug abuse, and commission of crimes in adulthood. 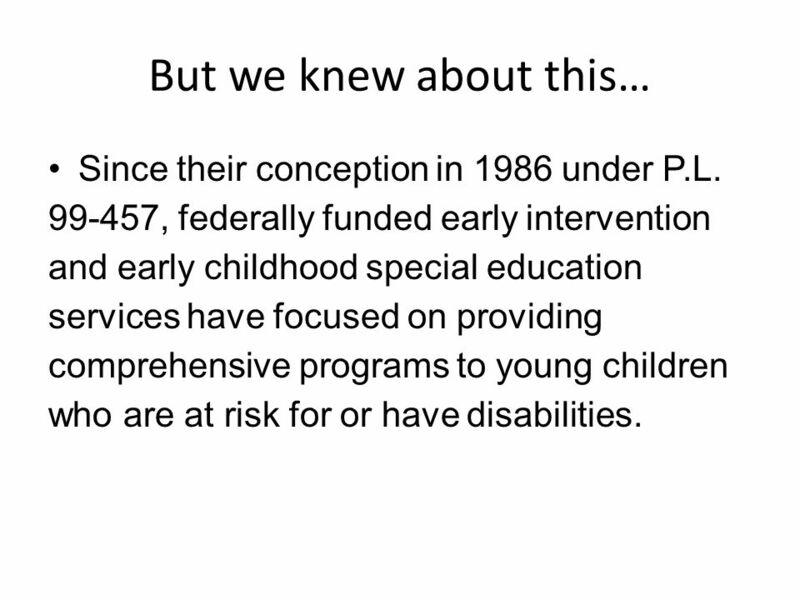 11 But we knew about this… Since their conception in 1986 under P.L , federally funded early intervention and early childhood special education services have focused on providing comprehensive programs to young children who are at risk for or have disabilities. 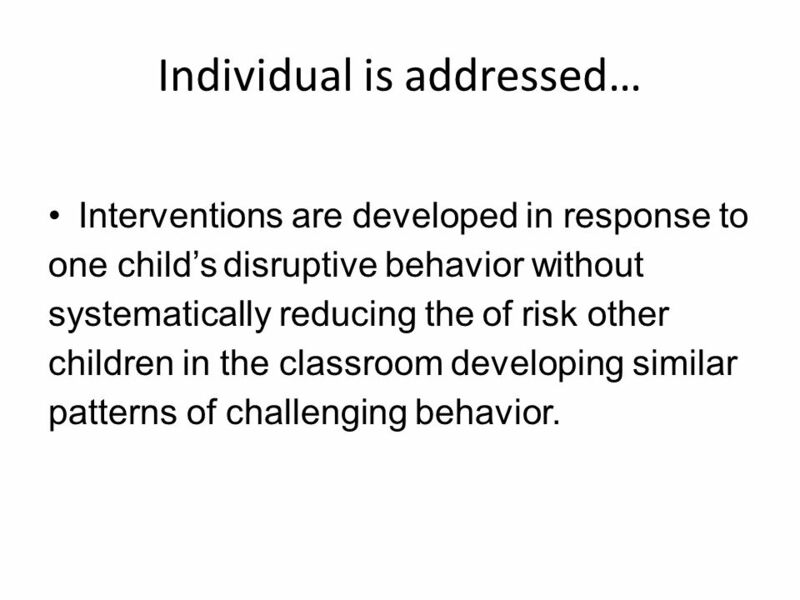 Interventions are developed in response to one child’s disruptive behavior without systematically reducing the of risk other children in the classroom developing similar patterns of challenging behavior. 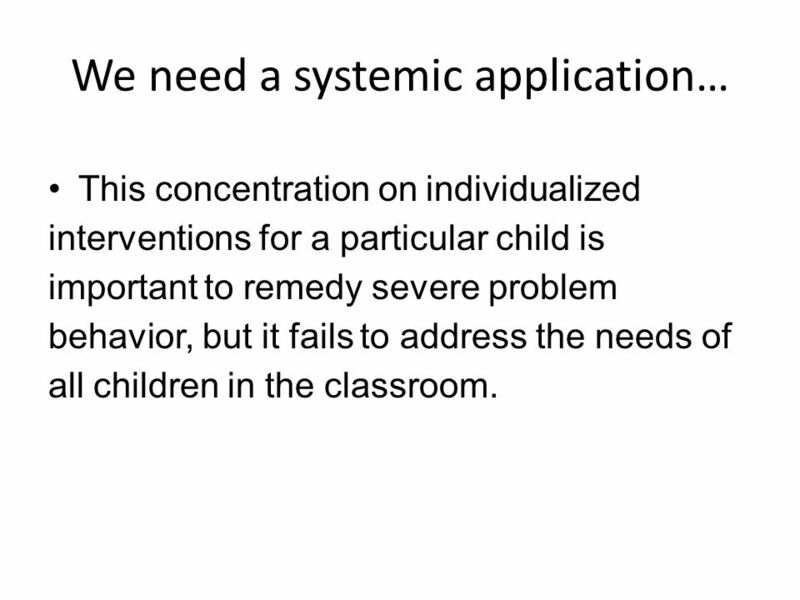 This concentration on individualized interventions for a particular child is important to remedy severe problem behavior, but it fails to address the needs of all children in the classroom. 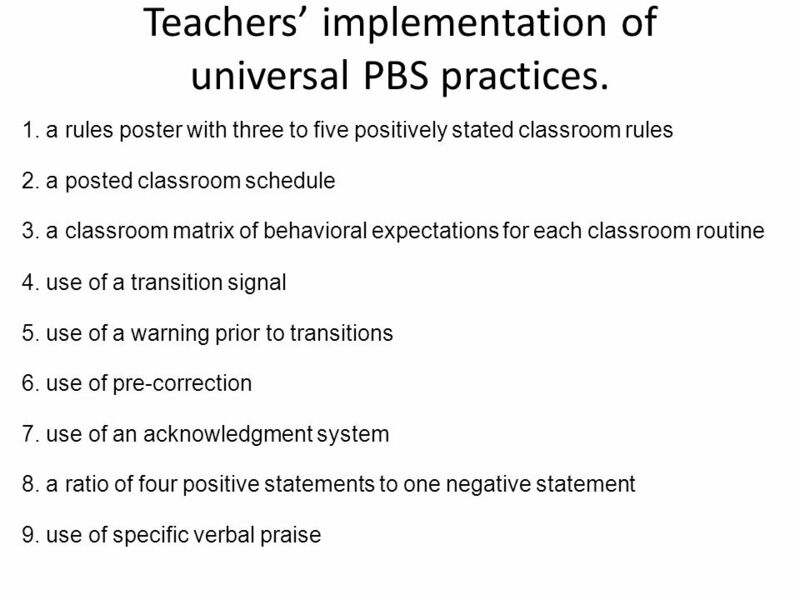 23 Teachers’ implementation of universal PBS practices. 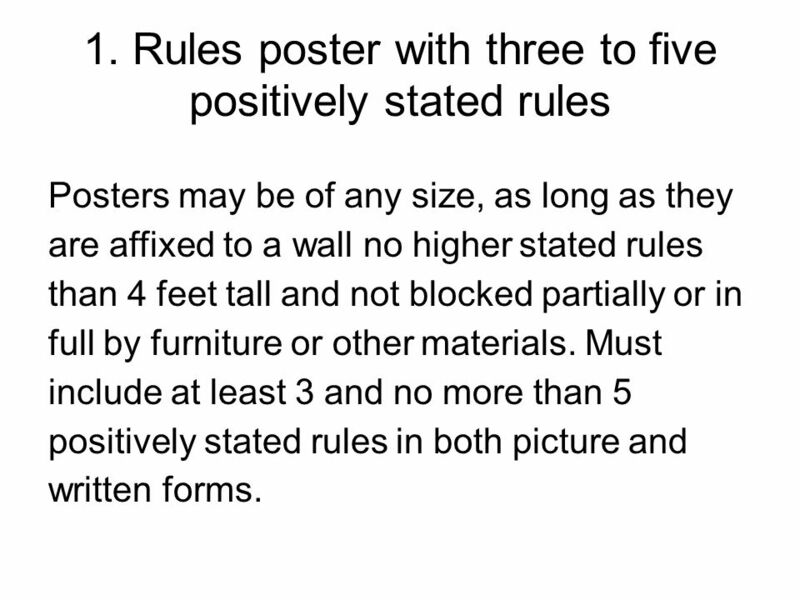 Posters may be of any size, as long as they are affixed to a wall no higher stated rules than 4 feet tall and not blocked partially or in full by furniture or other materials. 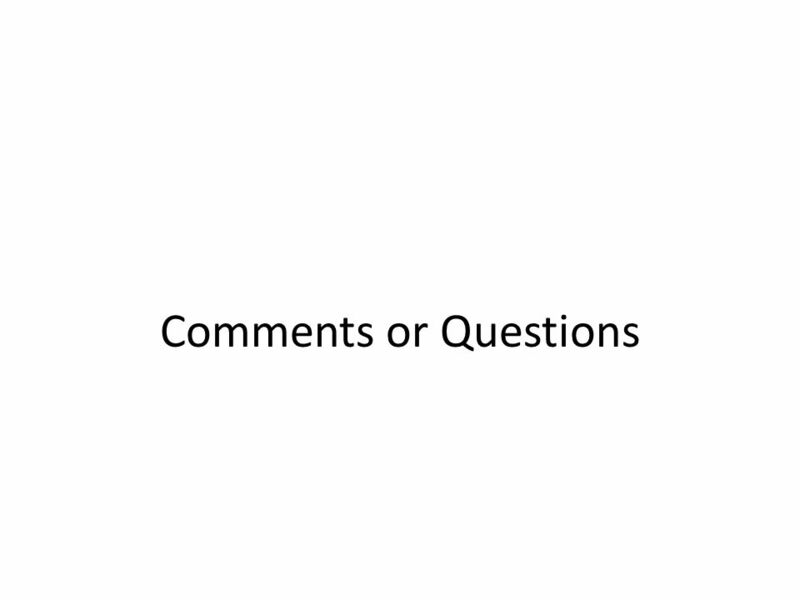 Must include at least 3 and no more than 5 positively stated rules in both picture and written forms. 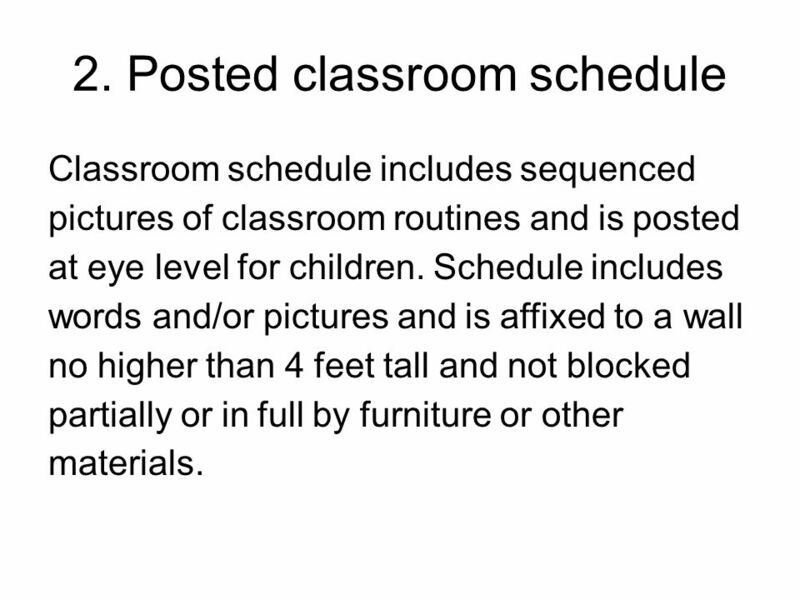 Classroom schedule includes sequenced pictures of classroom routines and is posted at eye level for children. 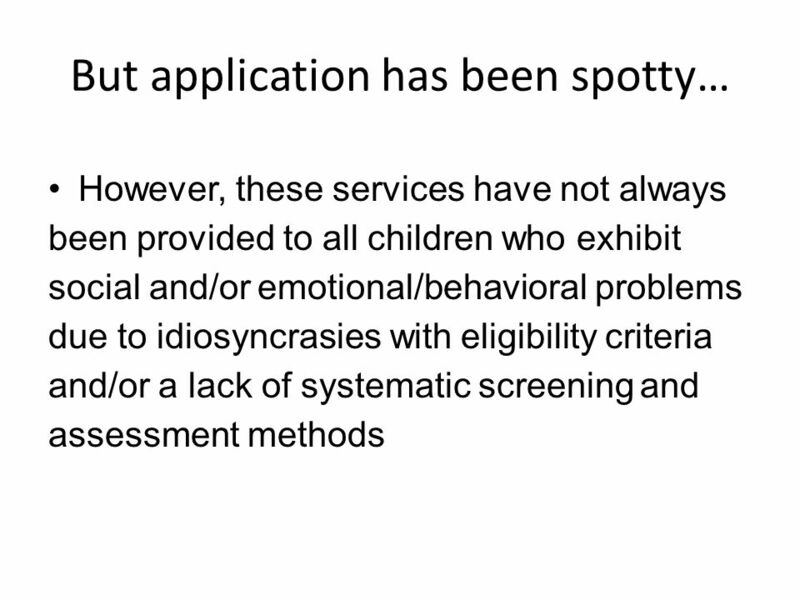 Schedule includes words and/or pictures and is affixed to a wall no higher than 4 feet tall and not blocked partially or in full by furniture or other materials. 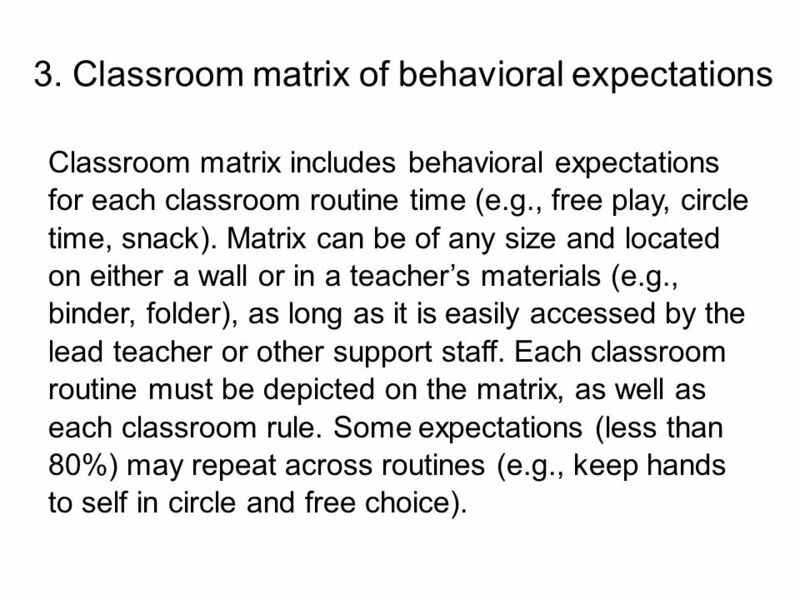 Classroom matrix includes behavioral expectations for each classroom routine time (e.g., free play, circle time, snack). Matrix can be of any size and located on either a wall or in a teacher’s materials (e.g., binder, folder), as long as it is easily accessed by the lead teacher or other support staff. Each classroom routine must be depicted on the matrix, as well as each classroom rule. 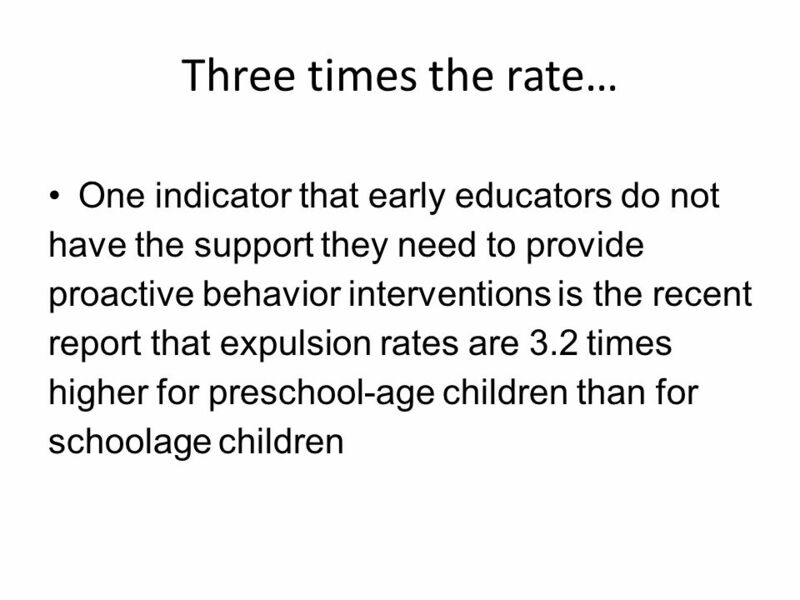 Some expectations (less than 80%) may repeat across routines (e.g., keep hands to self in circle and free choice). 27 4. 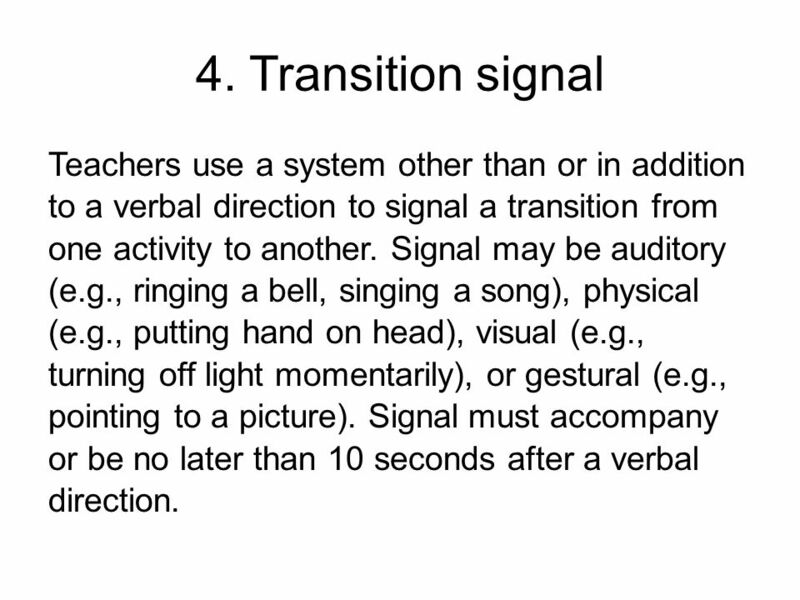 Transition signal Teachers use a system other than or in addition to a verbal direction to signal a transition from one activity to another. Signal may be auditory (e.g., ringing a bell, singing a song), physical (e.g., putting hand on head), visual (e.g., turning off light momentarily), or gestural (e.g., pointing to a picture). Signal must accompany or be no later than 10 seconds after a verbal direction. 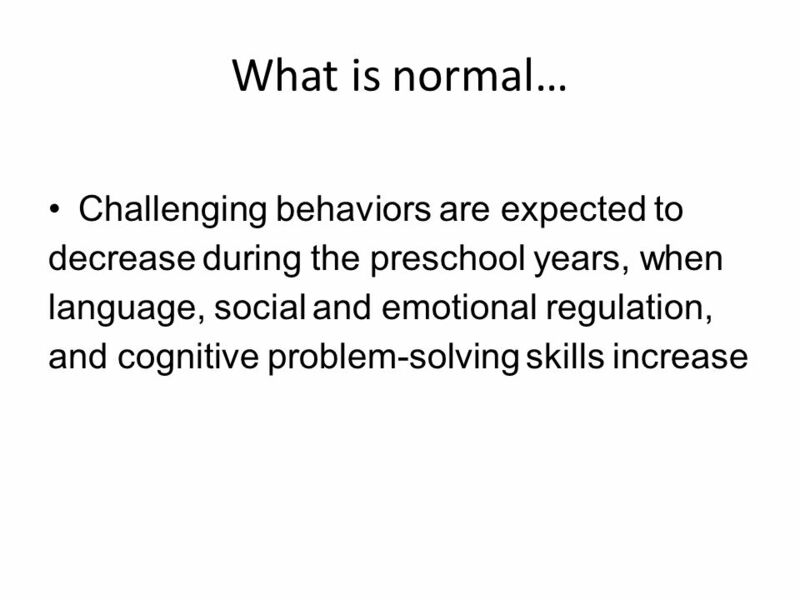 Teachers provide a warning before a transition from choice, free play, or outside play to another activity. 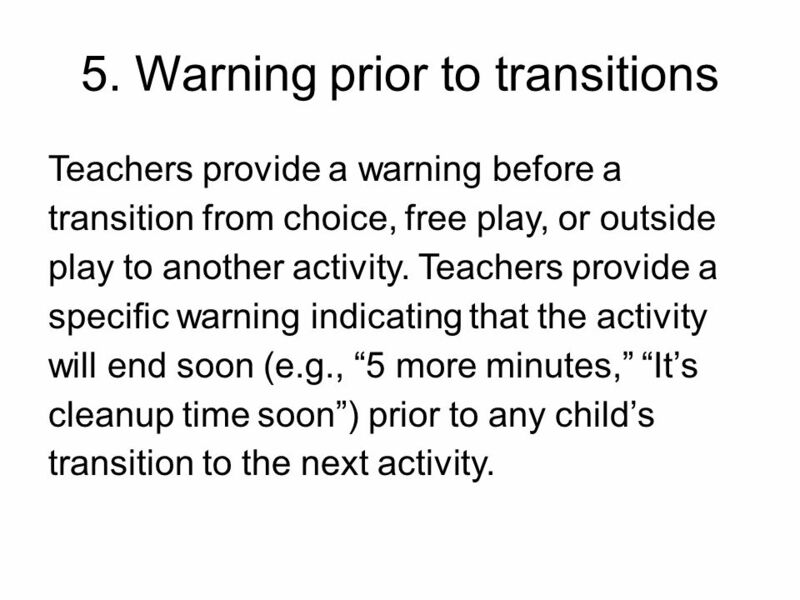 Teachers provide a specific warning indicating that the activity will end soon (e.g., “5 more minutes,” “It’s cleanup time soon”) prior to any child’s transition to the next activity. 29 6. 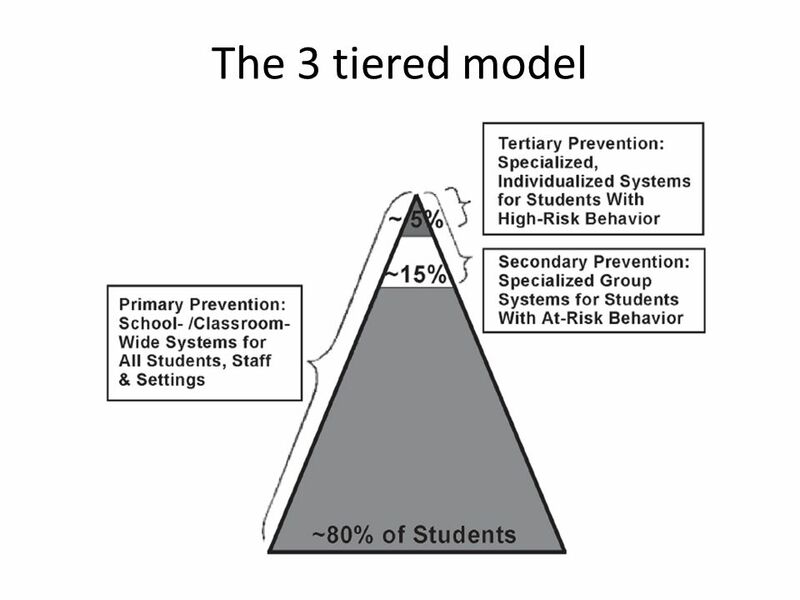 Pre-correction At least one teacher makes at least one statement about expected behavior to one or more children in the absence of misbehavior. 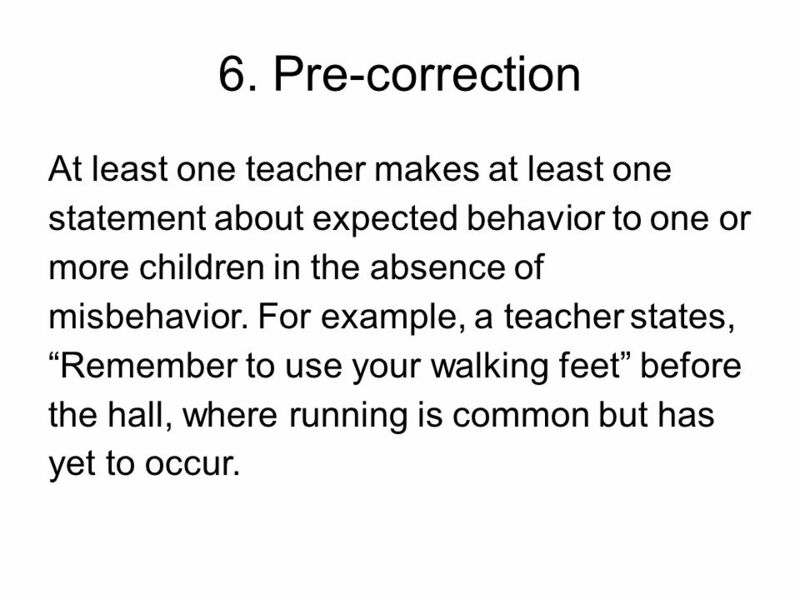 For example, a teacher states, “Remember to use your walking feet” before the hall, where running is common but has yet to occur. 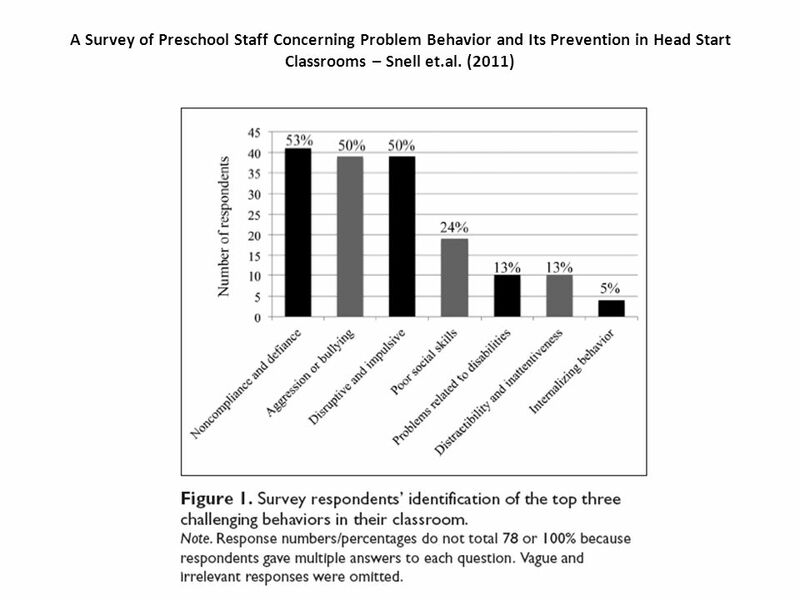 At least one teacher makes at least one acknowledgment of a child’s appropriate behavior, using a systematic procedure other than praise. May include activities such as giving children lotion for coming inside from the playground right away or providing children with a raffle ticket after they help a friend. 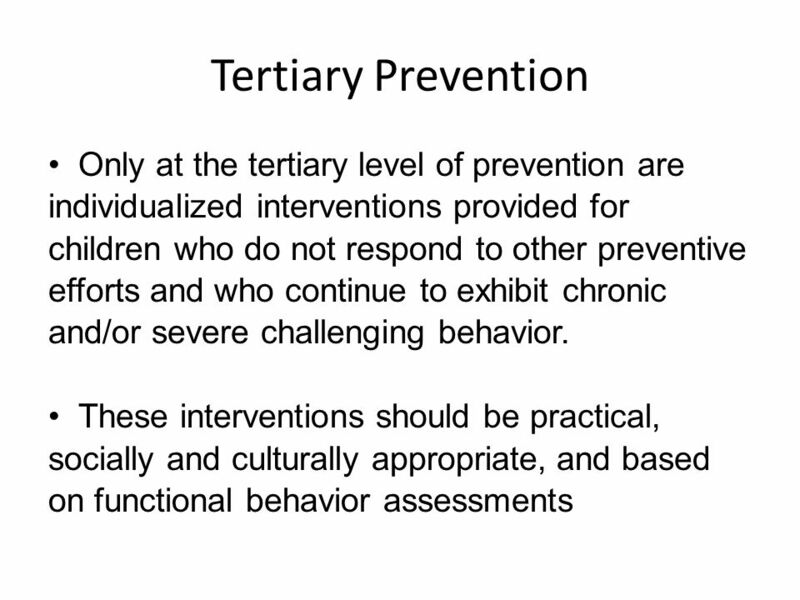 Acknowledgment in the form of praise is included if the praise is systematic and consistent across teachers for the particular activity, such as recognizing children who are sitting appropriately at each circle. 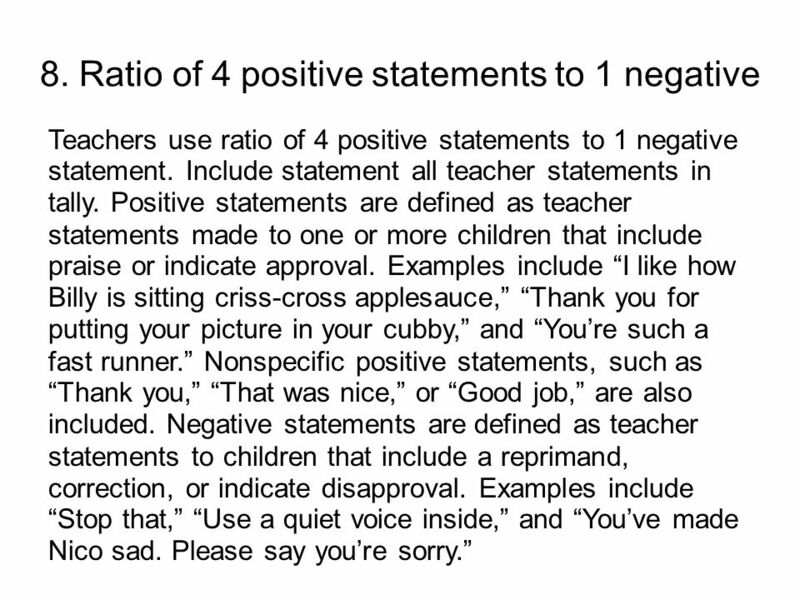 At least one teacher makes at least one positive and specific verbal comment to a child immediately following his or her appropriate behavior. 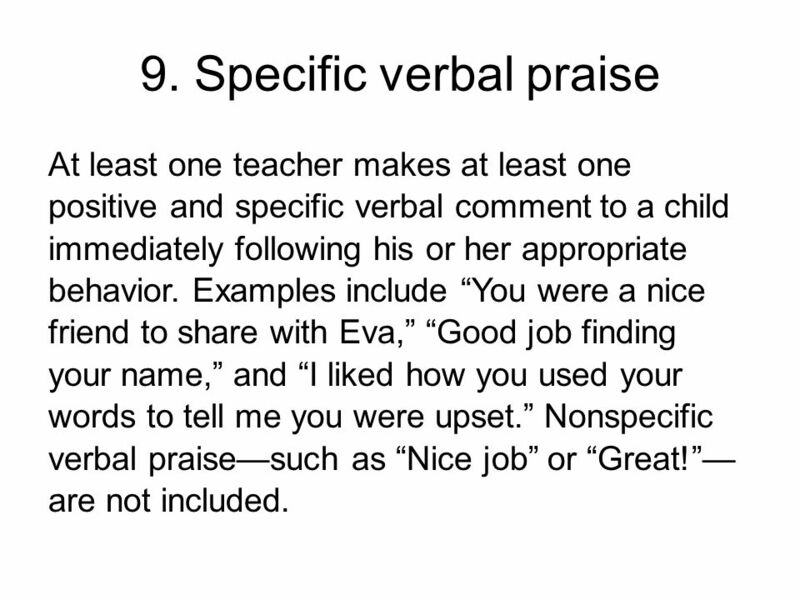 Examples include “You were a nice friend to share with Eva,” “Good job finding your name,” and “I liked how you used your words to tell me you were upset.” Nonspecific verbal praise—such as “Nice job” or “Great!”—are not included. 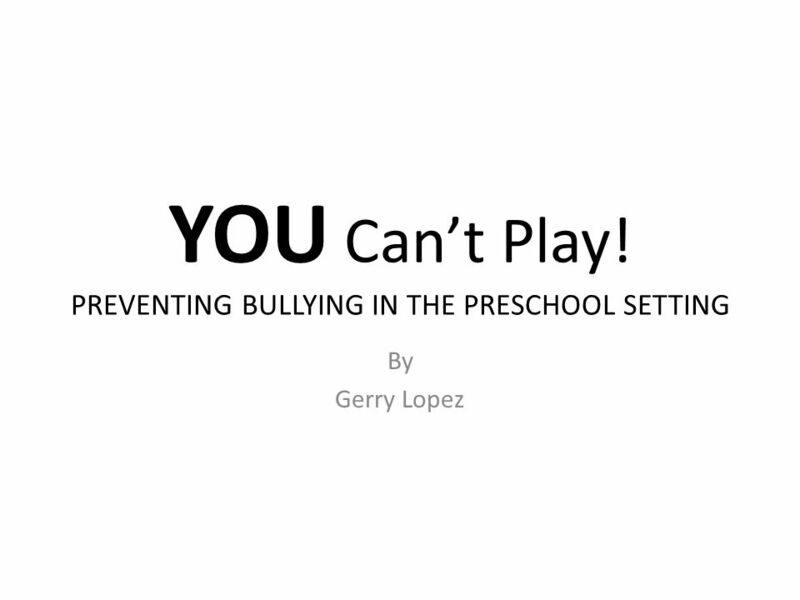 Download ppt "YOU Can’t Play! 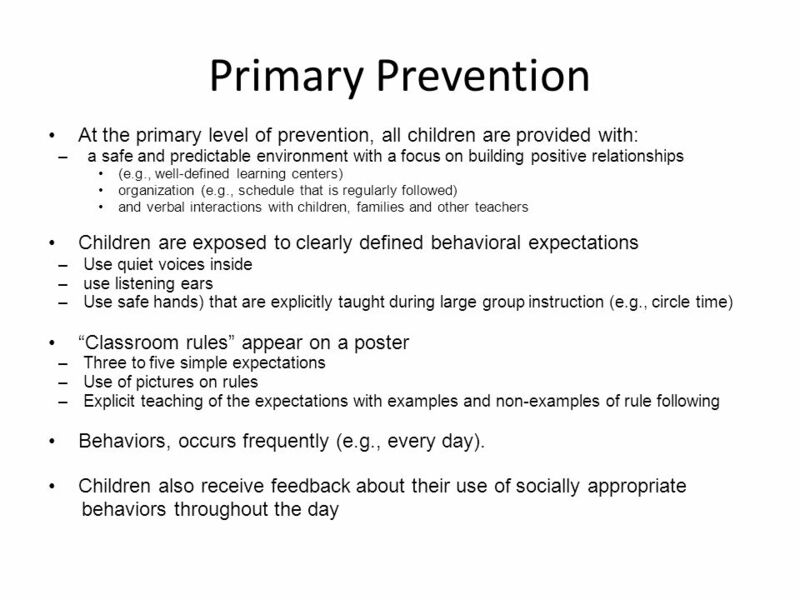 PREVENTING BULLYING IN THE PRESCHOOL SETTING"
I love you more than all the stars at night A Family Presentation On Ensuring Healthy, Safe, & Respectful Environments. 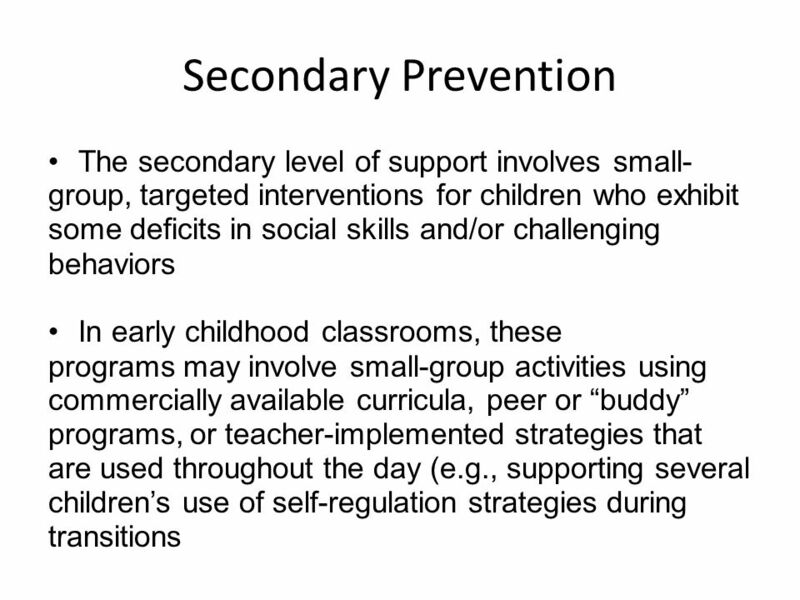 Classroom Management Practices Nicole Anderson. 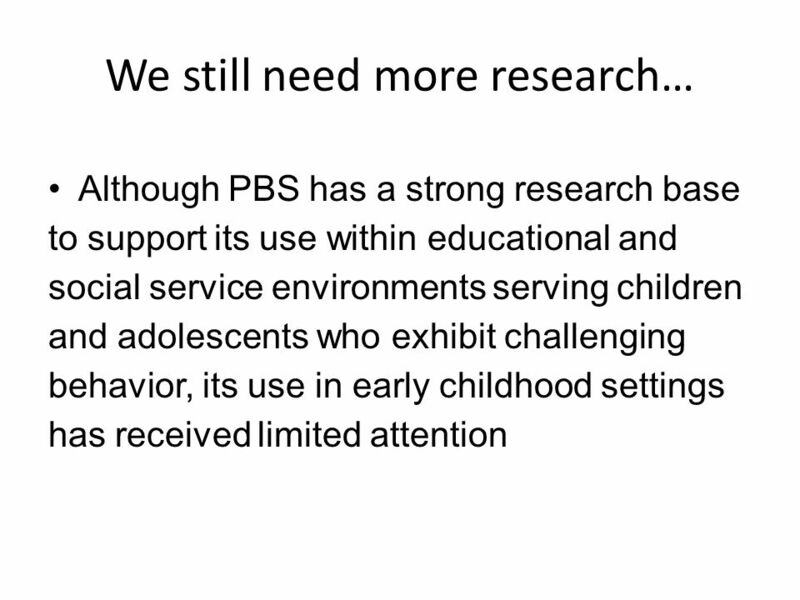 My Experience Worked two years as an IA III in a special education classroom for children with emotional. 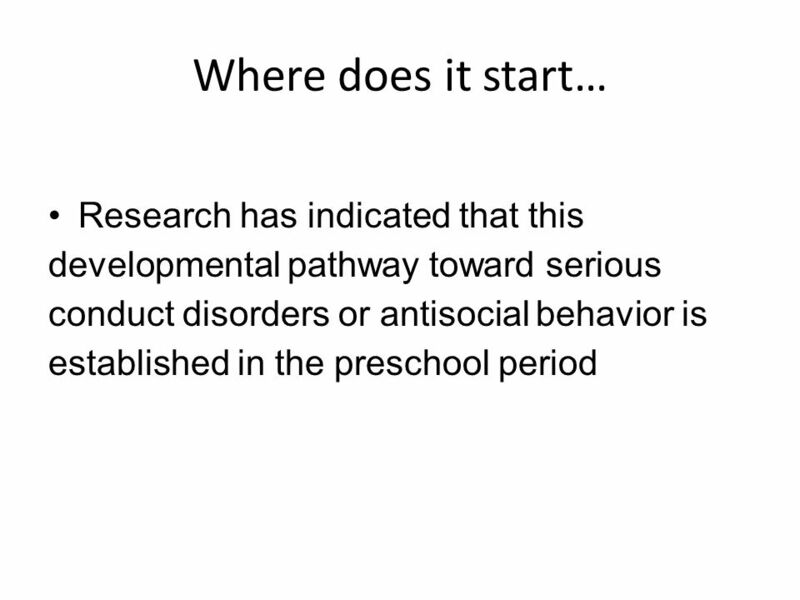 Positive Behavioral Supports for Students with ASD Module 8 Lesson 1. 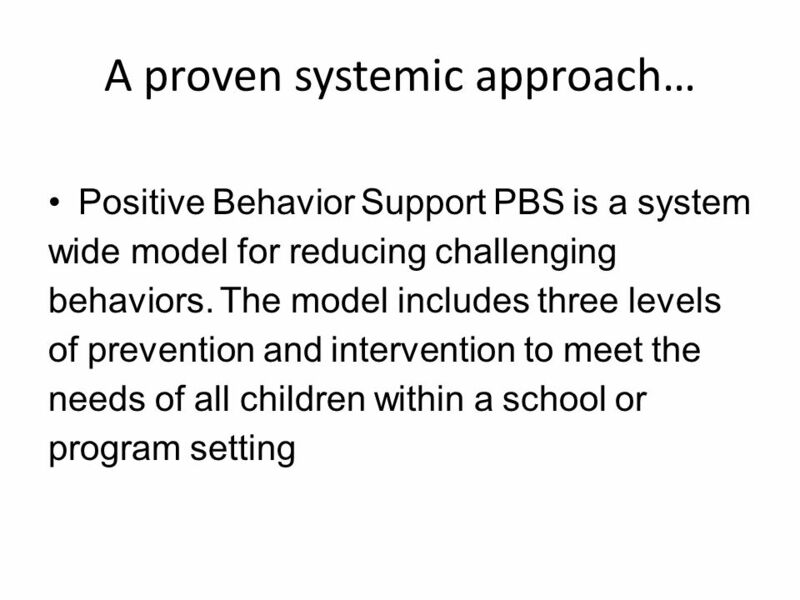 WWB Training Kit #22 Acknowledging Children’s Positive Behaviors. Objectives of this session: 1.Identify and write age appropriate classroom rules. 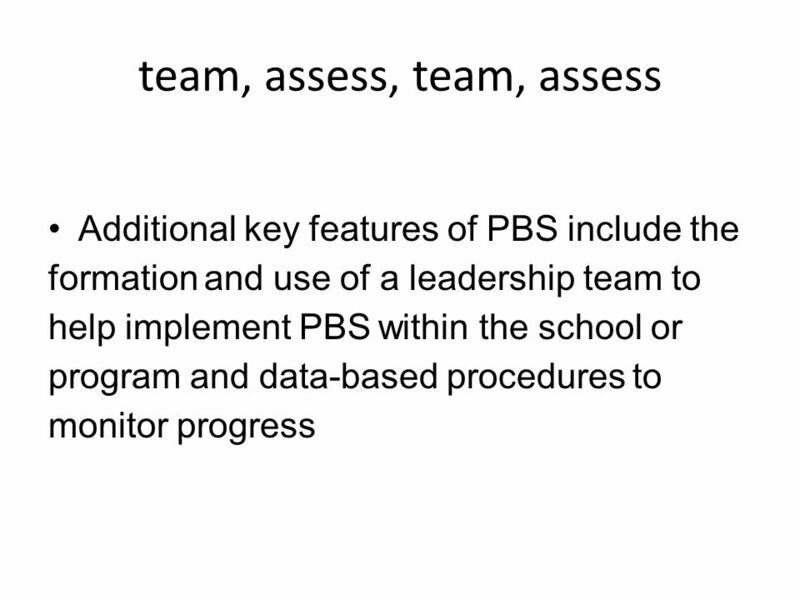 2.How to establish rules, routines, and procedures. 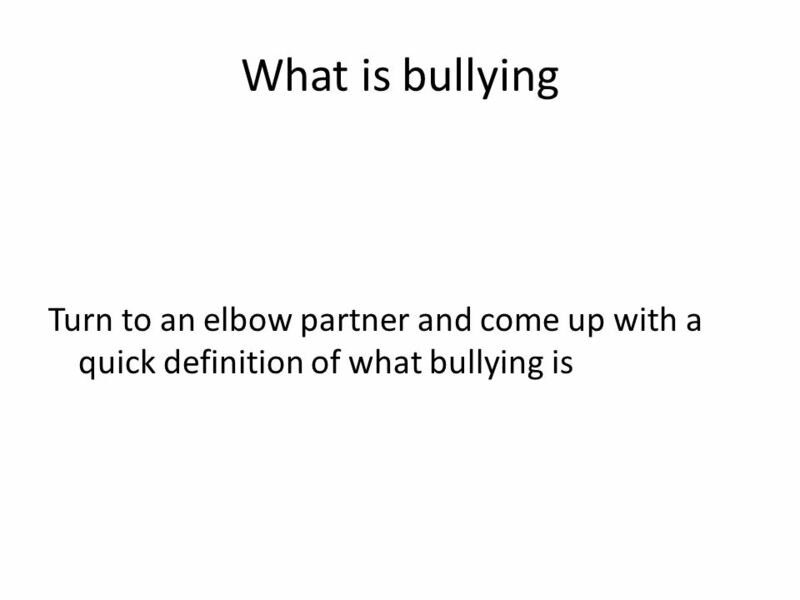 3.How to effectively.